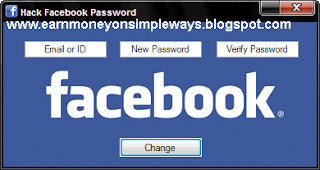 This advanced program will help you to hack facebook password of any account. All you need to know is their email address and you’ll be able to gain access to the users account. This program is to be used to recover and change your own facebook accounts password, to help a friend recover theirs with their permission, or for parents to keep an eye on their children’s accounts. If you use the hack facebook password program for any purposes besides this, you are responsible for your own actions. With that being said, the program hack facebook password is fairly simple to use. In the first text box you will insert the email address for the account or if you’re unable to figure that out, you can input the profile id which is usually like a 9 digit number sequence but can often be word or words set by the profile owner. You can find this number by looking at the URL when you visit the program. After you’ve got the first text box filled, set the password in the next two boxes. I’m well aware that you could simply use the program again in order to change the password if you didn’t input it correctly; however, to make it a more practical program you’ll need to verify that you typed it correctly. Finally, hit the "change" button. This will begin the process of logging you in and changing the password. When it has completed the task, you will be notified with a message box informing you it has completed and that you can now log in. Use the Hack Facebook Password program responsibly. You are responsible for your own actions. Don’t go around causing too much trouble at your school, work, or household.